Submental Fullness, also known as the dreaded double chin. Your “turkey gobbler” can be bothersome, unsightly and perhaps make you feel self-conscious. No matter how healthy your diet or how much you exercise you won’t be able get rid of that pesky pouch of fat under your chin. Lord knows I have tried! There is now an FDA approved non-surgical approach to getting rid of that double chin once and for all. This relatively painless procedure requires very little down time and you will start noticing results in as little as one treatment, with full results after 3-6 treatments spaced approximately two months a part. This revolutionary wonder treatment is called Kybella and is available here at BoxBar Vascular. The active ingredient in Kybella is synthetic deoxycholic acid, which is a naturally occurring molecule in our bodies that aids in breaking down and absorbing dietary fat and occurs naturally in your gallbladder. When this natural chemical is injected into the fat deposits under the chin, Kybella destroys the fat cells resulting in a noticeable reduction in fullness. Once destroyed these fat cells can no longer store or accumulate fat, so further treatment is not expected once your desired result is achieved. 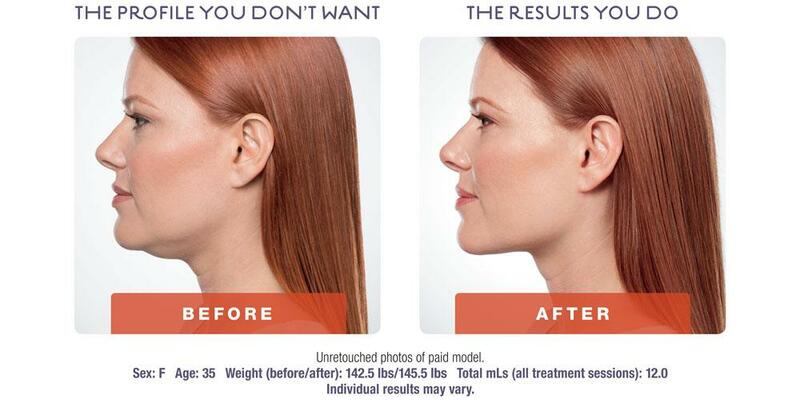 Call us today for your complimentary consultation by Dr. Ellen Derrick and say goodbye to that double chin forever!